Ever wanted to cycle down to Mrs Macquaries Road without the stress of four-wheelers? Well you're in luck because Sydney’s two-wheeled twilight event is returning as a part of the Sydney Ride Festival. 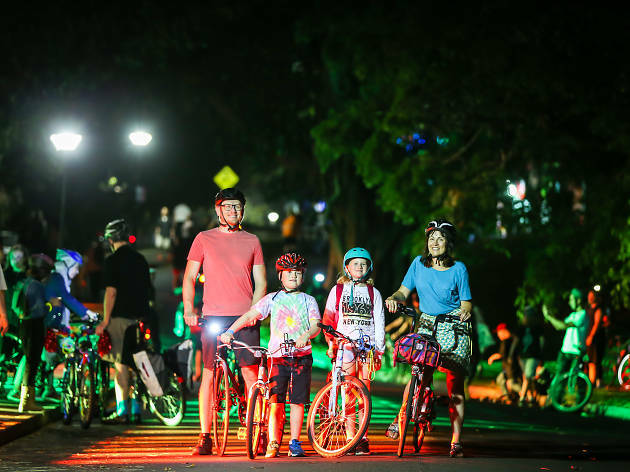 Hop on your bike and explore a totally traffic-free Mrs Macquarie’s Point, at this sunset event. The Halloween-inspired community celebration encourages you to get glowed up or dress up in your spookiest Halloween garb and enjoy sunset harbour views with some added surprises. For one night only the picturesque point will be closed off to cars, meaning you can wheel or wander through immersive lights and installations set up along the 2.5km loop. You can dance by the water at the sundown silent disco at Mrs Macquarie's Point, watch roving entertainers or dine from one of Sydney’s fabulous food trucks. If you're without wheels you're in luck, bike hire is available until. So, hop on and enjoy the fun as the sun goes down.